During a NASCAR Sprint Cup testing session today at Kansas Speedway, Denny Hamlin had something break in his car which caused his car to slide sideways into the turn. While Denny was trying to correct the car it hit the apron and shot him back up into the wall. This was Denny’s primary car that they were planning on using during the race this weekend and had also dominated at Loudon this year. Denny will be switching to another primary car that was a sister car and was running well at Chiccagoland before fuel mileage bit them. 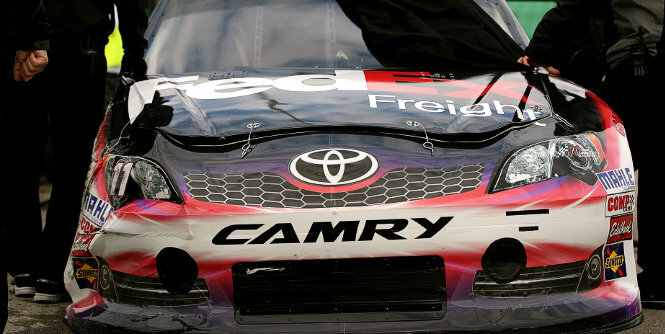 We’re glad Denny is ok and are confident this car should be just as fast! So glad your ok denny have a good race.